Uniform, well-graded diamond powder gives best results. Practically all particles are working constantly, resulting stock removal is fast, finish is superior and uniform without scratching or pitting. Poorly graded diamond powder is wasteful and unreliable. Uneven cutting results from the fact that only large particles contact work, while small particles do not work. Scratched, pitted surface is the result. Solar Diamond Lapping Compounds, particularly suited for the rapid polishing of all hard materials, are used extensively in the manufacture of precision components, tungsten carbide dies, precision gauges, optical flats and lenses etc. (Also in creating a high degree of finish for hard metal moulds, gem polishing and sapphire processing.) Only uniform well-graded diamond powders are used throughout the range of SOLAR Lapping compounds and Slurry. These powders are accurately and consistently graded by a special process to ensure individual particles of sound crystalline structure, blocky in shape with sharp, well-defined edges. The diamond particles are measured microscopically the size being defined as the diameter of a circle having the same area as the diamond particles when viewed through a microscope. Water Soluble :The water soluble version is entirely soluble in water or diethylene glycon. A very satisfactory thinner is a 50 per cent mixture of both. Great care should be taken to add just sufficient thinner to spread the compound. if the compound is thinned excessively it is liable to "Fly-off" the job when it is rotating at high speed. Oil Soluble :The oil soluble version is a special formula which has low Molecular Weight & is Heat Resistant. Use SOLAR "OS fluid" to give considerable covering properties & other benefits. 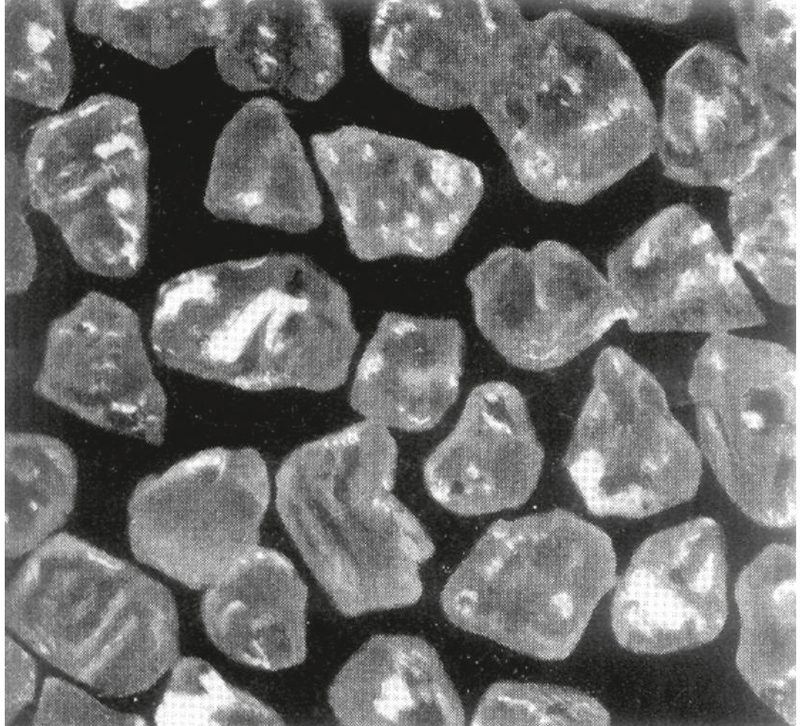 The diamond grain size of any particular paste can be instantly determined by its colour. This is further facilitated by the paste being supplied in translucent syringes. A list of these colours as they relate to the varying grades is given in the brochure. If use of conventional abrasive powder is terminated in range of 250/300 Mesh, then lapping with diamond paste should commence with SOLAR D 50 grade compound, followed by D 20 and then D 10: should. however. an extra high finish be desired, then D 3 should be used as a final polishing step. If use of conventional abrasive powder is terminated in the finer Mesh range of 400 to 600, then lapping should start with SOLAR D 30 grade, followed by D 10 and D 3. In super finishes use of D 1 as the last recommended step. NOTE : The harder the lap, the faster the rate of stock removal, and coarser the finish and conversely the softer the lap, the slower the cutting, but higher the finish. It is important to note that in many cases it is necessary to use two or three grades of SOLAR Lapping Compounds where the starting surface and that which is finally desired is a appreciably different. Use the paste as sparingly as possible. Initially apply just sufficient thinner to spread the paste over the working surface and then subsequently as much as is required to maintain lubrication. 1. Use standard concentration of SOLAR DIAMOND compounds for hardened steel, mild steel and chrome Plate. 2. 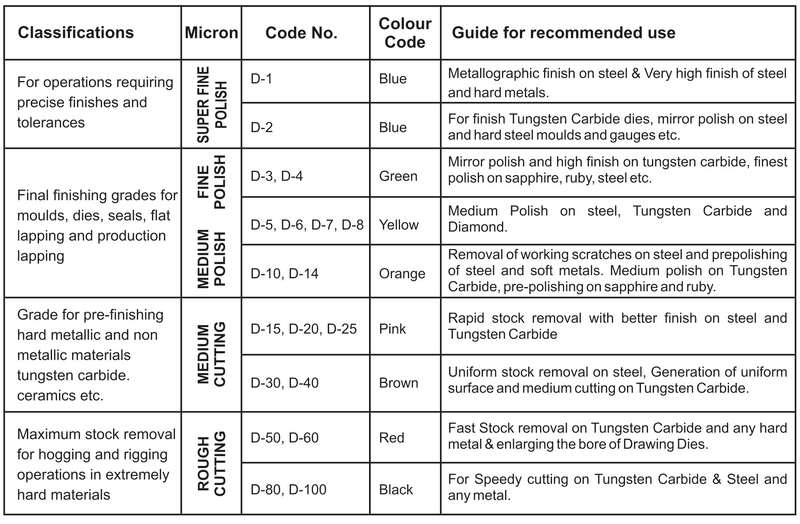 Use high concentration for tungsten carbide and other hard materials. Use high Concentration of compound on materials over Rockwell C 50, and standard Concentration under Rockwell C 50. 1. Clean equipment and area are of utmost importance for fine surface finish. 2. It is essential to thoroughly clean work surface completely before proceeding from coarser compound grade to a fine grade. 3. 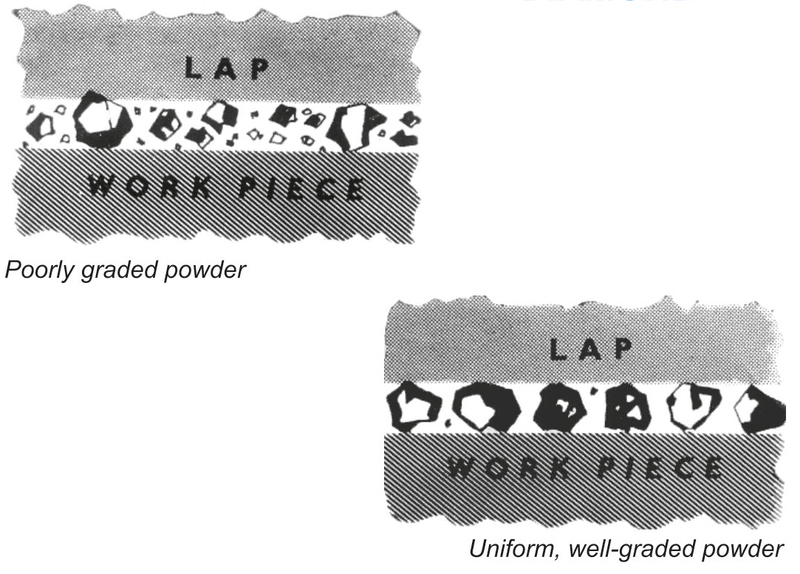 Laps must never be inter-changed between different grades. Use separate laps for each grade of compound. 4. Successive operations for finishing with different grades should always cross cut previous polishing lines. 5. Use medium speeds 2000-4000 RPM with flexible shaft machines, and moderate pressure for high finishes. Excessive speeds cause pitting and burnishing of finish. 6. Use SOLAR Compound sparingly. excessive amounts do not increase efficiency, If dry action occurs use SOLAR fluid in Aerosol Spray this will accelerate the cutting ability of the compound. ◆ Its lubricating action breaks metal to metal binding. ◆ efficiently removes matallic sludge that occurs during lapping. ◆ Penetrates instantly, exposing the diamond cutting points to action. ◆ Contributes outstandingly to high stock removal. ◆ It gives considerable covering properties. ◆ Exclusive aerosol dispenser prevents contamination. ◆ Economical and easy to use. Diamond Compound is available in standard & high concentration in 5 gm syringe packing in oil & water soluble. The successful mixing of fine diamond powder in a liquid, aqueous or oily, Where the finest diamond powder split up into single, evenly dispersed, agglomerate free particles led us to the development of Diamond Slurry at SOLAR. This agglomerate free suspension is of great use in extremely critical applications like the lapping of computer hard disk RNV heads, video heads and also in flat lapping of Tungsten Carbide and ceramic rings. Slurry which is available in oil, water as well as universally soluble base, keeps the diamond powder in suspension and even dispersion for long periods of time. The special composition of SOLAR Diamond slurries guarantee a 100 percent utilisation of all the diamond particles during polishing. Available in packing of 100 grams and 250 grams polyethylene bottles. All slurry concentrations can be formulated to meet specific requirements.